Astrology’s language is intent on describing the cycles and pulsations of Time. The twelve signs reinforce a pattern of alternate movements from inward explorations to outward expansions. Every “yin” sign is followed by a “yang,” followed again by yin. Over and over. Over time, this pulsation begins to feel like a beating heart, the syncopation of flowing blood, the moving breath. This pulsation is as natural as it gets. Our bodies understand it. The Cancer (cardinal water) focus of the current lunar cycle is a dive down and in. It will be followed by expansive Leo (fixed fire) sometime during the next lunar cycle. But not right away. More deep diving lies ahead. 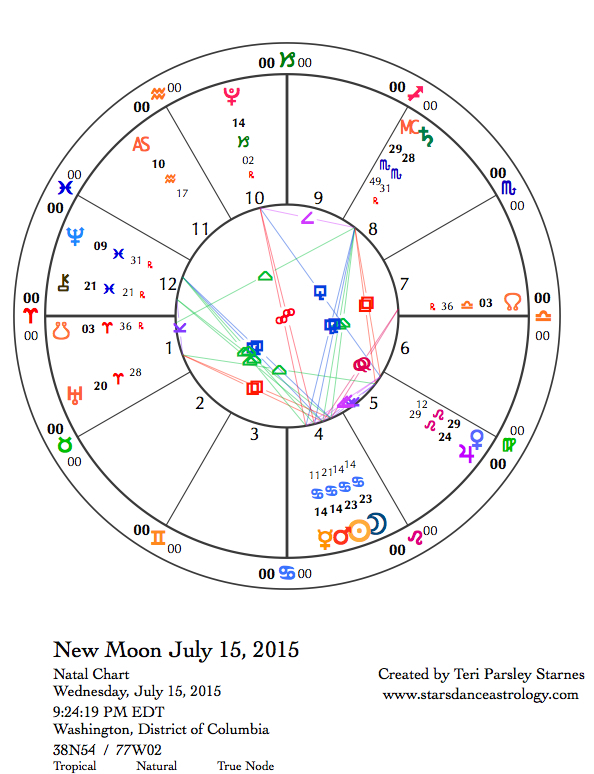 The week is marked by a New Moon in Cancer with Mars and Mercury in Cancer opposing Pluto in Capricorn (cardinal earth). Pluto is the deepest planet of all, located on the far edges of our solar system. In Pluto’s case, out means in. Pluto’s realm is dangerous—an edge between what is accepted and known and that which is banished and mysterious. Pluto doesn’t care it is no longer thought of as a true planet. Pluto never did play by the rules, except of course the ultimate rules of death. Pluto holds the title there. Cancer and Pluto are the reason we stay inside ourselves a bit longer. When the archetypes of Home (Cancer) and Death (Pluto) face off, things are bound to get a little intense and personal. A week after the July 15 New Moon, we begin to notice the handoff from Cancer to Leo. This coming lunar cycle will have tinges of both signs as influence and so we have the opportunity to follow mindful intention colored by the evolution of Cancer into Leo—from Moon glow to Sun shine. What is the gift of the interior experience? How does it help us move expansively out into the world? How comfortable are you with your shadow side? Under Pluto influences we have this choice: to turn away from unpleasant insights or to turn toward them. Turning away feels safer but seems to perpetuate the negative impact of our shadows. Turning towards them seems to release their power over us, freeing up vital energy. But it isn’t easy. What builds your capacity to see all your parts? That practice this week can help us move out of fear and into life, from Cancer recesses of defense into Leo expressions of life force. The transformation could be brilliantly healing but it requires us to be honest with ourselves. The lunar cycle opportunity this month has been to know our true homes better. Self-knowledge (Cancer gift) leads to self-expression (Leo gift). That is the promise of the next cycle beginning on the 15th. Day follows night. That’s another pulsation. Monday, July 13. Where did the love go? Venus in Leo (fixed fire) is square Saturn in Scorpio (fixed water) today and tomorrow, putting a damper on passion (a little). Saturn is asking that our relationships be more soulful, more intense, and more committed. That isn’t all bad. But we might notice the constriction that Saturn puts on things. The idea is to not undervalue ourselves. We deserve better connections. This aspect from Saturn may play a role in re-orienting what we want from our relationships when Venus takes a retrograde journey through the fixed fire sign Leo (July 25 – September 6). Stay tuned. We’re feeling sensitive: Mercury in Cancer (cardinal water) is trine Neptune in Pisces (mutable water) and the Sun in Cancer is trine Chiron in Pisces. We may also be feeling unfocused with the Moon in Gemini (mutable air). There is some disconnect between heart and mind to attend to. Tuesday, July 14. Venus in Leo (fixed fire) is still square to Saturn in Scorpio (fixed water), but with the old Moon now in Cancer (cardinal water), it is a whole different experience from yesterday. Relationships can be a sore spot. We might feel unappreciated or even worse, excluded from intimacy. The themes of the lunar cycle are being replayed. Where do we belong? What does Home mean? Saturn doesn’t only bring out our dissatisfactions with relationships, it can also encourage deeper commitments. Honest assessment of what you need is important. Feelings are the main source of information for now with the Moon in Cancer in trine to Neptune in Pisces (mutable water). July 15—New Moon: Dreaming. This soulful New Moon directs us to take it deeper. That may feel exhilarating and it might be frightening. The Pluto influence upon this lunar cycle presents both options. With the New Moon occurring in Cancer, we need to be mindful of those deep places we associate with Home. We began this exploration during the last lunar cycle. It reaches its climax early in this cycle to be passed along to the Leo mission so important this summer: to join with the life-force flow of creativity. The range of experience for this lunar cycle extends from the deepest places of our psyches to the most expansive expression of our potential. That is a big range, so let’s take it easy on ourselves and move patiently through it. 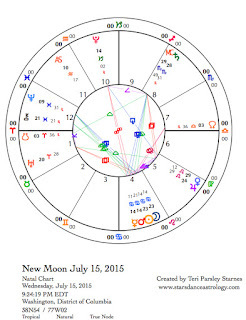 In the New Moon chart Mars and Mercury are conjoined in Cancer (cardinal water) and opposing Pluto in Capricorn (cardinal earth). The Mercury influence encourages expression. The Mars influence encourages action. The Pluto influence encourages confrontations and transformations. The Cancer/Capricorn axis is about nurturance and authority. Pluto and Mars interactions can be violent. Mercury/Pluto interactions can expose secrets. This dynamic positioning of these planets will be experienced personally and in world events. Oppositions invite release. Conjunctions are a time of beginnings. We may be able to release some fears and tell some truths. We have the opportunity to begin (with energy and honesty) a new path to Home (the Cancer influence). Thursday, July 16. Self-expression, creativity, generosity, gratitude—these are some of the elements that can get the fire of Leo (fixed fire) flowing again. This lunar cycle is an excellent opportunity to practice sensing energy. One of my teachers once described energy simply as what gets noticed. It is less mysterious than we think. We notice a lot all the time, but we may not be paying attention. Let yourself be curious about what you are noticing and wonder about the energy moving through it. Energy is a way we can connect with the world, become part of the life-force flow. Leo’s real search is to know they matter energetically. Friday, July 17. Since there are no exact aspects today, we have fewer cross currents distracting us from the observation of energy (see yesterday) and the cultivation of Leo (fixed fire) qualities. The Leo investigation is worthwhile right now since Jupiter is nearing the end of its yearlong transit of this sign and Venus is about to retrograde through this sign. To top it off, this lunar cycle will build in Leo influence when the Sun enters Leo on July 22. The Leo investigation includes tending the fires of our creative contributions to the world. What is the state of your heart-fire? What would help that fire burn more sustainably and give more of your light to the world? Leo remembers the joy of childhood. Notice that today. Saturday, July 18. Moon in Leo (fixed fire) contacts Jupiter and Saturn today. The Jupiter contact expands our needs to be seen for who we are. We may also be a little impatient and daring about taking risks. But the contrary square between the Moon and Saturn in Scorpio (fixed water) has us feeling the consequences of moving too fast or feeling “too full of ourselves.” The gift is to think about creating a sustainable and accountable container for creative expressions of all kinds. Transitions happen today in the early evening (CDT). Venus moves into the first degree of Virgo (mutable earth) where she stations to turn retrograde on July 25. The Moon also moves into Virgo and conjoins Venus at this potent degree. It is as if the Moon is “blessing” Venus on her upcoming journey. Venus retrograde periods are when Venus leaves the sky as the Evening Star, disappears into the rays of the Sun, and then emerges as the Morning Star a few weeks later. This disappearance is the visual representation of Inanna’s journey into the underworld. Virgo is attuned to healing and wholeness. This constellation is a priestess seen holding a shaft of wheat, invoking the theme of service through the sacred. Look to the west at sunset to see the Moon and Venus almost touching, with Jupiter very close by. This beauty inspires our desires to serve and heal and connect and inspires our own underworld journeys. The day also builds to an important square between Mercury in Cancer and Uranus in Aries. This transit encourages innovation yet may be felt as extreme agitation and restlessness if we don’t actively try to dispel that energy. The issue we need to talk about may be centered around the Cancer themes of home and nurturance. July 19—Crescent Moon: Beginning. We may wake feeling a little touchy. Mercury in Cancer (cardinal water) is trine Chiron in Pisces (mutable water) encouraging more emotional flow. The Moon in Virgo (mutable earth) opposing Neptune in Pisces adds to the possibility that we swing widely between feeling oceanic states of empathy or grief with grounded states of pragmatism. Neither alone is enough. Later the Moon makes a harmonious trine with Pluto in Capricorn (cardinal earth) encouraging a sense of competency and strength. All this is the background for the Crescent phase of this lunar cycle. Remember that this cycle begins in an interior, self-reflective state and moves to and expansive exterior one. Notice what is growing in your heart. What will you begin during this phase to nurture an outward expression of that? Each of us is a Sun. That doesn’t mean we are more special. That doesn’t mean we have to struggle with others to get noticed. That means each of us has an inherent gift to nurture at this time. Will you dare to claim yours?